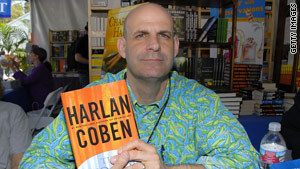 Ever wonder what author Harlan Coben gives for the holidays? Read on to find out. (Oprah.com) -- "O, The Oprah Magazine," asked some of our favorite authors which books they plan to give this season, and which they'd most love to get. I'm giving copies of the Qur'an, in a new translation by Laleh Bakhtiar. For anyone who wants to know more about Islam, or simply wants to read a beautiful book, this really is the most accessible version in English. Like everyone, I always ask for art books for Christmas, given they're not the kind of thing you buy yourself. I'm hoping this year for books of paintings in the Musée D'Orsay in Paris. This is my favorite museum in the world, and it has, I think, the most interesting, and most underrated, collection of paintings. "Grace (Eventually)" and the forthcoming "Imperfect Birds"
I'd like to get a big esoteric expensive art book that is too expensive to buy for myself and that only extremely hip people know about that I can put on my coffee table, so that everyone who sees it will think I am smarter and more erudite than I am. As for giving: I often give people Coleman Banks's "The Illuminated Rumi," which is staggeringly lovely to look at it, with all my favorite Rumi poems?you can pick a poem each morning as a daily meditation and get drawn into the amazing artwork and feel semi-well for the next 24 hours. I also give Sharon Olds's collected poems, "Strike Sparks," or the first volume of Mary Oliver's collected poems. These two books make everyone love me more?because now they know what to give everyone else?and make them feel like they owe me forever, which is the main reason I give presents. The book I'd like to get for Christmas: "The Complete Lyrics of Oscar Hammerstein II (edited by Amy Asch and introduced by Ted Chapin)," because Hammerstein was one of the greatest American artists of all time?his lyrics are poetic, romantic, and full of hope. Perfect for Christmas morning, with a message to carry the whole year through: "Choose love." The book I will give is "Brava, Strega Nona!," written and illustrated by Tomie dePaola. What's Christmas morning without a pop-up book? Italian wisdom from a wise witch and gorgeous illustrations, including an overflowing pasta pot where the noodles look like ribbons. Pure joy for children of all ages. I always try to give books from warm places, because I figure they are like mini vacations during the coldest days of the year. Though not always cheerful in subject matter, there's plenty to learn, think about, and certainly to enjoy in "The Other Side of Paradise," by Staceyann Chin, and "Love, Anger, Madness" by Marie Vieux-Chauvet. I have loved this book my whole life and I have always given it as a gift to friends, but since it's been published in English for the first time this year I can now give it to my English-speaking friends. It is a trilogy?three novellas set in Haiti in the 1930s. Each novella is a feast of its own. Love triangles. Military oppression. Sibling rivalry. Redemption through poetry. The author died in exile in the United States in 1973, and this is the first official translation. I love it when I get any book at all, especially by an author I've not read yet. But if I must choose, I'd ask for the new Ha Jin story collection, "A Good Fall," and anything by Asha Bandele, author of "The Prisoner's Wife" and "Something Like Beautiful," and any diet book that actually works. I always want to give books by Richard Holmes. His "Coleridge" particularly. Now we have "The Age of Wonder." It is history, biography, the Romantics, and science. It is also entertaining, well written, and generally improving. Who could ask for more than that? It is disgraceful that I haven't yet read E.L. Doctorow's "Homer & Langley." If I am given a copy I'll pretend I bought it myself. I would give the same book I give almost every holiday season. "Bird by Bird," by Anne Lamott. Purportedly a guide to writing, it is really about the neurotic mind of anyone who creates for a living. It is also hilarious and filled with valuable insights.